Last week we had a family movie night where we all relaxed in my bed and watched Mr. Popper’s Penguins. When it comes to actors, I would say that Jim Carrey is one of my favorites. There are not too many of his movies that I don’t like. Actually I can’t think of one off the top of my head that I don’t like. Mr. Popper’s Penguins is hilarious! We watched it last week and this movie had me laughing throughout the entire time. It is one of those films that you can watch over again without getting bored. There are actually a couple of Jim Carrey’s films I have watched at least a dozen times. 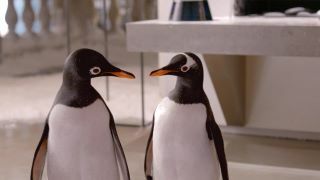 This movie a funny comedy about a businessman that has his life turned upside down with the delivery of a silly penguin to his luxury suite in New York. When he first receives the penguin, he is fast to try to return it to its rightful home. Once his children come and find the penguin, he is stuck with the penguin and the many crazy things a penguin can do while they are not in their own environment. This movie will be available on DVD on December 6, 2011. 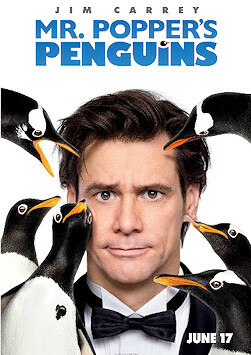 Right now you can reserve the Mr. Poppers Penguins DVD on Amazon for only $16.99. Disclosure – I received a review copy of this DVD to provide you with this review. This post is not a paid post and the opinions stated herein are 100% my own.